Quad-core Mobile Chip: Is It Overkill? Intel Prepping 2.93 GHz Mobile Core 2 Duo? Is Apple Revamping Its Laptop Line? Intel Outside Apple's Pending MacBook Launch? Is Apple Thinking About Ditching Intel Chipsets? Will Nvidia Invade and Change the Apple MacBook Line? "With the first phase of the iPhone 3G launch in the rear view, Apple Inc. is now shifting much of its focus towards product refreshes targeting its two other revenue drivers and is advising resellers to be prepared for product shortages in the interim. "Apple is said to have specifically identified 13-inch MacBooks and 15- and 17-inch MacBook Pros, but made no mention of the MacBook Air." "Is four processing cores inside a laptop overkill? Probably not for gamers. Intel is expected to meet this insatiable need for speed when it rolls out it first mobile quad-core processor. "An Intel executive is on the record stating an August roll-out. "And this may happen sooner in August than later. System vendors may go public with information about the quad-core mobile processor as soon as August 11, according to sources. This is when other processors, such as the Core 2 Quad Q9650 (3 GHz), are expected to go public." Link: Intel Quad-core Mobile Chip Coming: Is It Overkill? "Intel already plans to upgrade the Core 2 Duo processors for its Centrino 2 mobile platform with a new range-topping model, a new leak says. With its present mobile chip line topping out at 2.8 GHz, the semiconductor firm is reportedly set to introduce a 2.93 GHz model that would share the same 1.07 GHz system bus and 6 MB cache and which would still keep its power usage down to a peak 35 watts, rendering it efficient enough to run in thin-and-light notebooks while offering performance close to the 3.06 GHz Core 2 Extreme." Link: Intel Prepping 2.93 GHz Mobile Core 2 Duo? "Apple is readying a major product transition. We know because they told us so. In the quarterly financial crime call chief financial Officer Peter Oppenheimer referred several times to a '...future product transition which I can't discuss today'." "What product transition could cost $150 million? "The Mac unit split is 60/40 'Books/desktops. The iMac desktop line has just been refreshed and the Mac Pro line, while the packaging is getting old, has state of the art workstation innards. "Enough already about the health of Apple CEO Steve Jobs. It's time to turn our attention to something more interesting - namely, that "future product transition" Apple Chief Financial Officer Peter Oppenheimer mentioned several times on the company's recent earnings conference call. "Most important, this new, smaller machine could sell for less than $800 - new price territory for Apple. (The current starting price for a MacBook is $1,099.).... Perhaps in time we'll be so accustomed to using touchscreens that we no longer need a mouse." Link:Is Apple Revamping Its Laptop Line? thinner, slightly more rounded cases than current MacBook and MacBook Pro with design cues from the MacBook Air. Intel Centrino 2 platform chips. "The MacBook might be getting changes inside and out in the next several weeks. "Apple might have decided its partnership with Intel doesn't mean it has to use all of Intel's products. "AppleInsider reports that Apple could be using a chipset from a different company - or even an internally developed one - in the next iteration of the MacBook, expected to arrive in the next six or eight weeks. Like other notebook vendors, Apple had been using Intel's mobile Centrino chipsets in its MacBook line ever since 2006 but it's going to pass on the Montevina version of those chipsets this time around, according to the report...."
Link: Intel Outside Apple's Pending MacBook Launch? "Apparently tired of using the same basic architecture in its computers that its other Windows-based rivals do, Apple is thinking about not adopting Intel's so-called Montevina chipset, the key component of Intel's Centrino 2 platform, according to AppleInsider. "This does not mean that Apple would stop using Intel CPUs, just its chipsets which usually controls everything else in a computer. AppleInsider even throws out there that Apple may have its eye on a new set by Intel-rival AMD which includes faster integrated video, Hyperflash I/O and support for Hybrid Hard Drives (regular hard drives with flash components means to load faster). Imagine that, Intel chips and an AMD chipset." Link: Is Apple Thinking About Ditching Intel Chipsets? "To me, there is no doubt that come fall you will find updated MacBooks and MacBook Pros with Nvidia chipsets and GPUs inside." "A new kind of trackpad for the next generation MacBooks, if speculation is correct, could lead to the elimination of the classic mouse button, replaced by multi-touch gestures, according to Seth Weintraub at Computerworld on Wednesday. "Referring to speculation about a new kind of trackpad for the next generation of MacBooks, Mr. Weintraub wondered about the 'death of the mouse button.' The author pointed to a YouTube video that shows how Mac OS X Leopard can be controlled by classic iPhone gestures." "For now, the only devices which include a multitouch trackpad are the MacBook Air and the last MacBook Pro. For example, this allows them to zoom on pictures. Stef from Montpellier has decided to put one on his MacBook. "In order to do so, he brought the electronic parts (specifically the trackpad) of a MacBook Pro to his MacBook. He sent us a video proving that the system works like a charm...."
PR: ViDock Gfx is the ultimate graphics expansion for notebook computers taking advantage of the powerful ExpressCard expansion slot of modern systems, enabling additional displays to connect to your laptop portable computer. ViDock Gfx brings uncompromised desktop class speed and quality video to notebook computers. Village Tronic announces that the beginning of Jeremy Sutton's tour is a lecture on July 29 at the Regent Street Apple Store in London where he will be giving a free lecture including a live art demonstration. Then on to the Oxford Internet Institute on July 31st where he will demonstrate how state-of-the-art digital media can be used by a 21st century fine artist by transforming digital photographs into fine art paintings. 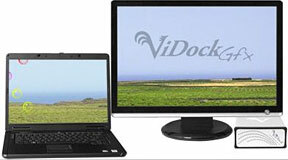 One device that will be used at both lectures is Village Tronics ViDock Gfx. Jeremy stated, The ViDock enabled me to give a live painting demonstration from my MacBook Pro last week in a dramatic and effective way that would not have been possible without the ViDock.. This is exactly what I had been looking for when I had a booth at WPPI this year and, since it didn't exist then, I ended up shipping a Mac Pro tower computer since it had two DVI ports built in. Thank you Village Tronic (Jeremy Sutton). This is also free and open to the public. Starting August 1st thru the 4th, Jeremy will be holding a workshop for all levels at Pembroke College in Oxford. This will be a workshop that will try to help unleash creativity with digital media and how to maintain a balance between control and structure with improvisation and freedom of expression (Jeremy Sutton). ViDock Gfx will be one of the digital media headliners and will assist with creating a dynamic presentation and easy of using other tools and supporting graphics. Jeremy is a great example to show who the ViDock family of graphics docking solutions was created for and its versatility across the business spectrum: the professional user that wants to use a single portable computer both on the road and the option to utilize multiple screens when needed whether that be in the office, studio, classroom or at home. ViDock Gfx takes advantage of the fast connection offered by ExpressCard technology, the latest standard from PCMCIA for notebook expansion, to deliver an uncompromised user experience in terms of speed, responsiveness, 3D acceleration and resolution support. With the options of VGA, DVI Dual Link, or Dual DVI video output (Pro Edition), all the displays currently in the market can be supported, including the 30 ones at 2560x1600. The operating system compatibility ensures support for Windows Vista, Windows XP and Mac OS X. Aero accelerated user interface for Vista is also supported. ViDock will be on the market bundled with the valuable software application VTMultiDisplay that improves the user experience when working with multiple screens. Thus, allowing the user to analysis large quantities of data. Creative professionals can take advantage of ViDocks powerful multi-display support to experience the final work on one screen while viewing edit commands on another. ViDock also allows the user to turn a notebook into a high performance graphics platform, with full HDTV support perfect for artists, gamers, and home users alike. "MacBook Air requires a USB optical drive for the installation of Microsoft Windows XP SP2 (Service Pack 2) or Microsoft Windows Vista (32-bit versions only). The Remote Disc sharing software included with the MacBook Air cannot be used to install Microsoft Windows. Be sure to connect your external USB optical drive to your MacBook Air before starting the Boot Camp Assistant." PR: Laptop Laidback is specifically designed as a laptop table that provides users the ultimate in comfort by providing them full control and flexibility to place the laptop in the best position possible, designed specifically to provide ultimate comfort for laptop users on a bed, couch, lawn chair, etc. The Laidback makes it possible to optimize the ideal arm, hand, neck, shoulder, and leg positions recommended by ergonomists to maximize comfort when using a laptop computer. Comfort is key in this context When you're comfortable, you are also pain and stress free, and can extend your laptop usage, be more efficient and effective, and can significantly reduce further stress on your body. The correct position is to always have your upper arms and elbows resting on a flat surface (no reaching), so the laptop table must adjust up and down so your palms and fingers rest on the keyboard (without having to lift your elbows off the support surface). Laptop Laidback makes it easy to achieve this body English. The patented new Laptop Laidback Version 3 is a boon to laptop users with disabilities, back problems or mobility issues. The product can be used in bed, on a sofa or in a recliner type chair, and is fully adjustable (to maximize comfort), easily stored, and portable. 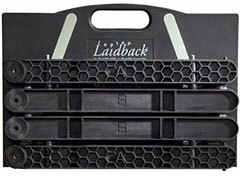 Laidback is designed to be a dedicated purpose product and to fulfill that purpose uncompromisingly well, so Laidback We "R" Inc. don't recommend purchasing it to eat snacks on, use as a TV tray, or a perch for the bird. 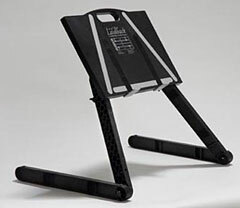 The product is specifically designed for laptop users who want to maximize comfort in the horizontal position, although that being said, they do have customers that have found other uses for Laptop Laidback such as a stand to rest a book on while reading in bed. How strong is Laptop Laidback? It will hold up to 22 lb., which is well in excess of the heaviest Mac laptop ever built. Laptop Laidback is easy to assemble without the use of any tools. There is a simple diagram printed on the back side of the laptop table, and it takes about 1 minute to assemble. The Laidback 3 is made from an engineered polymer which deliver strength, light weight (under 3 lb. ), and durability. The product measures 11 inches by 16 inches. Laidback We "R" Inc. warranties its product for 1 year from date of purchase, and the product is sold with a "30-day money back" return policy with no restocking fees but shipping costs in either direction are not refundable. 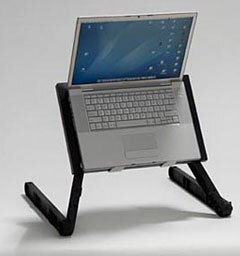 Editor's note: The Laptop Laidback laptop stand for use in a relaxed, reclined posture is a longtime favorite of mine and I've been using one since 2001 - the original model made from Nova Scotia maple hardwood. It's a high-quality piece of equipment, and it looks and feels as good today as it did seven years ago. PR: Targus Inc. has announced its Zip-Thru 15.4" Corporate Traveler Laptop Case, the first in Targus' line of checkpoint-friendly laptop cases. As a derivative of Targus' award-winning Corporate Traveler line, this case is designed to help business travelers eliminate the hassle of having to remove their laptop from their laptop case when passing through airport security, thereby minimizing the possibility of the laptop being lost, stolen or damaged during the security screening process. As a leader in the laptop case category, Targus is proactively designing solutions to make the traveler's airport security screening experience more stress-free. The Zip-Thru case is designed to meet guidelines established by Transportation Security Administration (TSA), which focus on the screeners' ability to get a clear image of the laptop when properly secured in the bag. In developing the Zip-Thru case, Targus worked in conjunction with TSA authorities to test the product through an actual airport screening device. "Our Corporate Traveler line is already a favorite case among business travelers, and adding the new Zip-Thru feature makes it a must-have for anyone who travels with a laptop," said Al Giazzon, vice president of marketing at Targus. "The new Zip-Thru Corporate Traveler laptop case is the lightest in its class, and features our patented SafePort Air Cushion System, which helps to prevent laptop damage if the bag is dropped or bumped. The unique combination of features emphasizes our dedication to delivering unsurpassed solutions, making the traveling experience smoother and more efficient for travelers." Designed with the same features as the lightweight and durable Corporate Traveler laptop bags, the Zip-Thru cases' patent-pending design splits the case down the middle, thereby isolating the laptop on one side to allow for clear x-ray scanning. 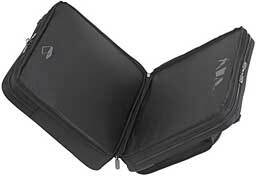 The bag also provides ample space for accessories, files and other devices needed by today's frequent flyer. For maximum comfort during travel, the Zip-Thru 15.4" Corporate Travel laptop case includes a padded ergonomic shoulder strap with non-slip coating to keep the case in place. 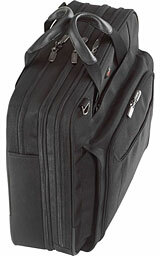 The first Zip-Thru case will be available in black and made of durable ballistic 1680 denier nylon. 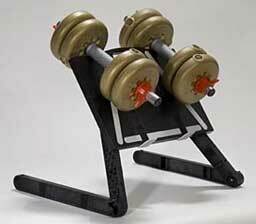 It measures 16.93" x 6.5" x 13.98", weighs 3.74 pounds and has an MSRP of $99.99. Backed by a limited lifetime warranty, the Targus Zip-Thru 15.4" Corporate Traveler Laptop Case (Model Number: CUCT02UA15SUS) will be available in October through Targus Commercial Distribution, Resellers, DMRs and at Targus.com. PR: The Targus 15.4" Widescreen Notebook Privacy Screen is designed to fit 15.4" widescreen laptops. To protect your information, tiny vertical blinds on the surface of the screen narrow the viewing angle so data is only visible directly in front of the monitor up to 45 degrees away from the center of the screen. Onlookers will only see a dark unclear screen when attempting to view the information from a side angle. 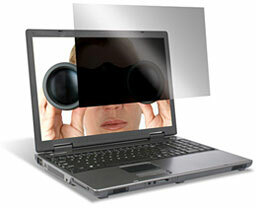 In addition to providing security, the privacy screen also blocks the glare to help reduce eye strain. The Targus Notebook Privacy Screen can be easily attached by using clear adhesive strips designed for LCD screens or with the included tab guides that stick to the edge of the LCD screen to hold the screen in place. Users can position the tabs so the screen easily slides on and off. Highly portable and easy to use, the Targus privacy screen protects valuable information on a laptop and LCD monitor from onlookers. You'll also receive News about the Best & Latest Products for your Laptop and Exclusive Discount Offers on Laptop Accessories. Your once-a-month newsletter includes special offers and announcements of products to make using your laptop easier, safer and more productive, news on recent developments in mobile computing and updates to the Laptop Computer Care & Feeding Guide. Contained in the guide is a search tool to find nearby hotspots wherever you go. Just enter your zip code (or full address for more accuracy) and an up-to-date list of free and paid hotspots will be shown. Contains over 100,000 WiFi hotspots in 128 countries. LapWorks respects your privacy. We send email no more than once a month. Any email we send will contain information, news and offers related to mobile computing. Your email address will never be sold or shared with any third party. LapWorks is a laptop accessory manufacturer that prides itself on putting the customer first. We offer innovative products at affordable prices. PR: QuickerTek announces another new Apple Juicz model - a new way to power the Apple MacBook and MacBook Pro using free and environmentally-conscious solar power. Apple Juicz offers the ability to power and charge with an external battery. This is perfect for the Air because it's the only way to get extended battery life. Unlike old syle solar panels, this new design is flexible and is much lighter than those thick glass cells that weigh far too much to be portable. Three lightweight solar cell options easily unfold from 10.5 inches to various sizes from 30 inches to as large as 60 inches. A very cool Element backpack is included which stores both your MacBook and the Solar Cell. There's even a LED charging status indicator so you always know what's going on. Included are adapters for cars and airlines. Rather than pack several batteries to get up to 8 additional portable power, Apple Juicz users can easily gain additional hours of use. Apple Juicz for MacBook and MacBook Pro folds to only 10.5 inches and comes with a free Element carry bag. It offers 55 Watts of power and unfolds to a sun-grabbing 60 x 42 inches. The Apple Juicz Solar Charger requires the sun to charge your MacBook, MacBook Pro or MacBook Air. The flexible thin-film solar cells will charge the MacBook Air in five hours. Since the MacBook Air has a non-removeable battery, alternative power options are welcomed by the Mac community. Especially "green" options. All models require an upgraded MagSafe power adapter. QuickerTek can modify the customer's adapter for $25.00 or you can purchase a modified MagSafe power adapter for $100.00. Military-spec parts fortify the design, as well as upgrade it for solar power use. Either way, the adapter retains the original functionality with the added advantage of being able to hook into the Apple Juicz line. Like most QuickerTek products, the Apple Juicz Solar Charger is backed with a one-year warranty on parts and labor. PR: Hotel rooms and airport terminals never seem to have enough power outlets to charge all the devices today's traveler brings along. Now you can add outlets and peace of mind on business trips and vacations with the Belkin Mini Surge Protector. This new design features three AC outlets and two powered USB outlets* - perfect for MP3 players and mobile phones. Few changes this week; one fewer MacBook Air model and one more 17 incher. Each model comes with an Apple one-year warranty, and ground shipping is free.